The excellent wide cycle tracks in Tavistock Place need your support! Go to Camden’s online response page here and fill out the consultation before 21 October. It takes just one minute! Make sure you answer Q6 “Would you like the current street layout… to become permanent?” as Yes. And Q7 “Would you like the street to return to its pre-trial layout…?” as No. You don’t have to live in Camden but you do need to provide an address and postcode. You could also add in the comments on Q8 that you want to ensure tracks and pavements are high quality, that junction “hook risks” are avoided and that traffic volumes and speeds of motor vehicles are both kept low. You could also suggest an improvement from the current scheme would be to find ways to avoid having loading/delivery bays in the track. Last December, Camden set up a 12-month trial that doubled the space for cycling in Tavistock Place and Torrington Place. This was achieved by making Tavistock Place one way eastbound for motor traffic. The former bi-directional cycle track became the eastbound cycle track and the former westbound vehicle lane became the westbound cycle track. 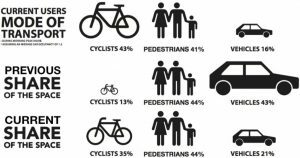 The fairness of this re-allocation of roadspace is indicated by the graphic below . You can find full details on the trial with data on its effects on traffic counts, air quality together with Camden’s proposed final form of the scheme on Camden’s website here. The scheme has been hugely successful in encouraging more travel by bicycle – with average increases of 30% at peak times over counts in 2015 and improving air quality with pollution reductions of up to 21%. It won the ‘Best Borough Infrastructure Scheme’ at the LCC awards in May 2016. Unfortunately, there are many objections to the scheme. To start with, taxi drivers have been very angry that they can no longer travel westbound between Bedford Square and Gordon Street on their way to Euston Station. The Imperial Hotels group has made a big fuss about the fact that east-facing taxis are unable to lower their wheel-chair ramp in the Taxi bay outside. More recently, a group of local residents has created a petition to kill the scheme and are currently delivering flyers to that effect to households in the area. It would be a disaster to have to take out the trial and return to the original dangerous and overcrowded two-way track. You can find information about solutions for many of the residents’ objections here. Camden’s consultation runs from Monday 12 September to Friday 21 October. We need positive responses from the hundreds, if not thousands of people who see the importance of this scheme. Since it is a vital link in the central London Grid and the street is used by staff and students of the colleges in the area, Camden will accept responses from a wide area. And please tells us on info@camdencyclists.org.uk if you can help out with leafletting!